A long-held favorite pastime of families in the southeastern United States is driving around looking at houses decorated with Christmas lights, lawn ornaments, and dazzling displays of holiday cheer. If you're planning to visit Nashville or the Middle Tennessee region, there are plenty of great places to experience the joy of the holiday season with your family. These annual sparkling, twinkling displays—all in celebration of the Christmas Holidays—are enough to keep you coming back to the Nashville region year after year, If you're looking for even more to do do this holiday season, there are many Christmas events, too. Listed below are some of the best holiday lights and wondrous displays that Nashville and the surrounding region have to offer during the Christmas season. Open nightly from Thanksgiving through New Year's Eve, Chad's Winter Wonderland in Lebanon is just a half-hour drive northeast of Nashville—and totally worth the trip. Along with over two million Christmas lights, the attraction features a drive-through Santa house (with a real Santa inside), Dancing Snowman, and a Christmas train. For decades, Chad Bernard has been putting up this drive-through holiday light display, one of the nation's largest, and it's become one of the region's residents' favorite places for a fun family outing. Chad's may close during inclement weather. Otherwise, you can enjoy the lights from 6 p.m. to 10 p.m. each night. The cost is $15 per car. 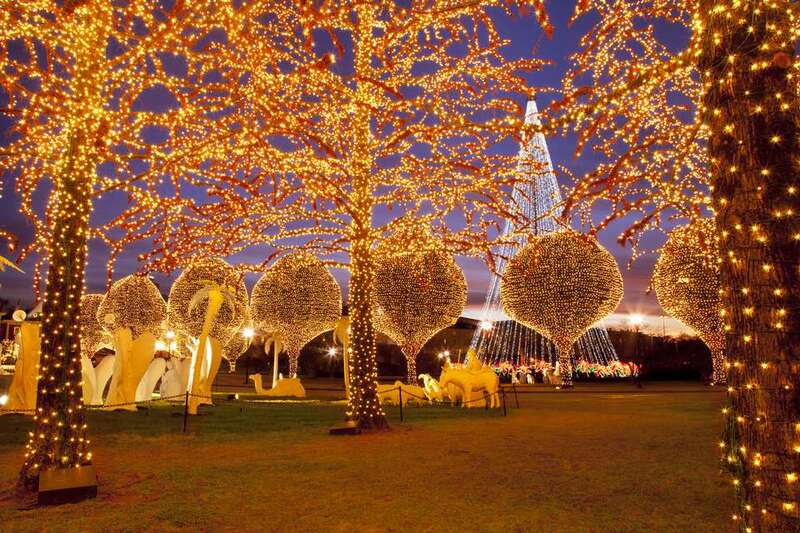 Also located in Lebanon, The Dancing Lights of Christmas is a scenic driving tour through the James E. Ward Agricultural Center where visitors get to view numerous lighted displays celebrating the Christmas season. This season, the drive-through is open nightly until December 31, on Sundays through Thursday evenings 5 to 10 p.m. and Friday and Saturday nights 5 to 11 p.m. Activities include getting pictures taken with Santa, pony rides, jumping high in the spider jump machine, climbing the rock wall, or taking a ride on a Christmas train. There's also a special store on site for Christmas gift shopping featuring delicious treats and locally handcrafted items. The cost is $25 per vehicle. About an hour northwest of Nashville on I-24, over one million Christmas Lights are on display in the City of Clarksville's annual festival of lights at McGregor Park. Every year this event attracts over 10,000 people to this small city where the Montgomery County Park's RiverWalk is decorated with several holiday light displays, including giant toy soldiers, animated toys, and a tunnel of lights. The free event is open Sunday - Thursday from 5:00 to 10:00 p.m.
and Friday - Saturday 5:00 to 11:00 p.m. The City of Clarksville is also putting on several events throughout the month of December in the park, including caroling, making reindeer food, Christmas card creations, letters to Santa, gingerbread house building, elf school relays, and ornament making. This Music Valley drive-thru, fully-computerized LED light and music show is a one-of-a-kind experience from Shadrack Productions found about two hours east or west along I-40 at either the Tennessee Smokies Baseball Stadium in Kodak or the Ballpark at Jackson in Jackson. Cost is $25 per car. At both locations, visitors will enjoy hundreds of thousands of energy-saving LED lights performing in perfect synchronization with the fantastic holiday tunes either by automobile or by horse-drawn carriage at Jellystone Park. Guests can also enjoy Santa's Village, photos with Santa, "Hey, Hey, Hey!" rides with Yogi Bear, an open fire complete with s'mores, hot dogs, hot cocoa, and other fun activities nightly through January 6, 2019. Now over a decade old, Lights on Old Charlotte is located in Franklin, Tennessee and offers a computerized Christmas display with, at last count, over 60,000 Lights, 144 Channels of Light-O-Rama computer control (invented in Tennessee), and 21 Channels of DMX Control. The show is broadcasted over a Low-Power FM Transmitter that can be heard on 89.9FM. The Upper Room Chapel brings back its collection of nativity scenes, called "Night of the Child Nativity Exhibit," with over 150 renditions from 40 different cultures around the world in the Chapel Museum from November through January each year. Although there aren't any Christmas lights in the exhibit, this stunning display is a perfect reminder of the "reason for the season," and while you're visiting the Museum, make sure to stop by the famous woodcarving of Leonardo da Vinci's painting "The Last Supper" sculpted by Ernest Pellegrini. Nearly two million Christmas lights draw visitors from near and far to see this annual spectacular, a tradition among locals and always a favorite that's completely free of charge to attend. While there, you can also check out the "ICE! featuring Dr. Suess' How the Grinch Stole Christmas" performances and Christmas display. The resort offers package deals for a holiday stay. Started in 1982, Walk Thru Bethlehem, presented by Woodmont Christian Church, has offered Nashville a delightful living recreation of the ancient city, and this year it happens for one night only on December 8, 2018, from 1 p.m. to 7 p.m. The focus of the event, located at 3601 Hillsboro Road in Nashville, is on the birth of Jesus and the true meaning of Christmas. While there is no admission charge, donations that benefit local community-based initiatives are encouraged and accepted.